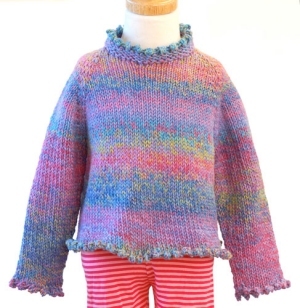 : Adorable sweater with ruffle edging. Size US 9 - 16" circular needles, US 9 - 24" circular needles, US 9 double point needles, stitch markers, scrap yarn, and a tapestry needle are required but not included. Girl's chest: 26 (28, 30, 32, 34)"
Gauge: 16 sts and 20 rows over 4"
Addi Turbo Circular - US 9 - 16"
Addi Turbo Circular - US 9 - 24"